Details like a wall niche in the shower for shampoo and conditioner come in handy. Sometimes I go into a home or stay in a hotel and think, “Yes, this is it — why didn’t I put these features into my home?” A well-placed outlet or thoughtfully installed drawer can make your life more organized and your morning or evening routines much smoother. Of course, what might inspire me might not work for someone else, but here’s an introductory guide — from a woman’s perspective — to making your space more functional and desirable, particularly if you’re making the move to a new condo. This is not to say that these features are what all women want; we’re much more complex than that. But if you use it as intended, you may find the details are of paramount importance. 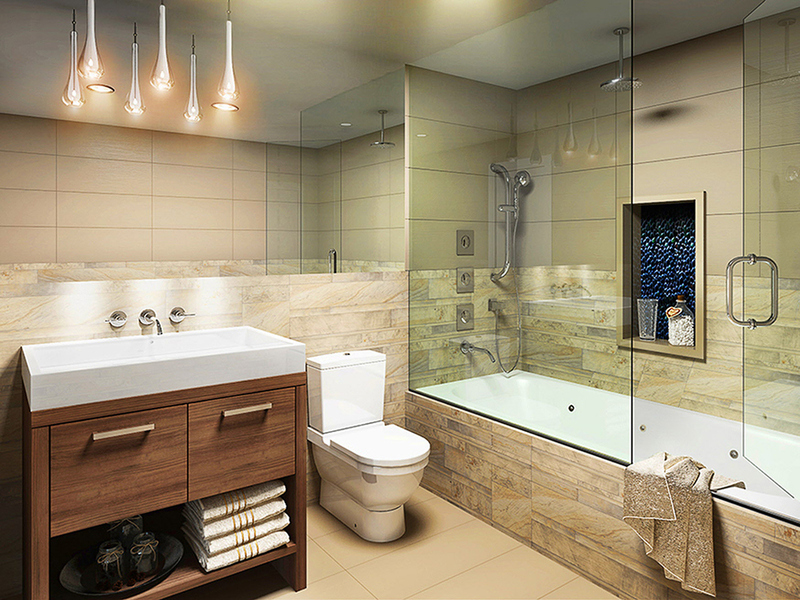 Before you plan the layout of your new condo, think about your routines. What do you do in the morning? What do you find tedious and what is enjoyable? Do you watch the news on TV and, if so, where? Then go through each routine carefully, with a pad and pen handy, and consider how you could streamline each activity. Let’s face it, we’re all busy people and adding a few minutes here and there would help provide extra time for relaxation or fun later on. Consider whether there are flaws in the design of your current living space and how you could optimize a new space to eliminate them. For instance, do you enjoy reading? Would you read more if you had a great chair in a quiet, light-filled space? If so, think about creating a reading nook, somewhere removed from the main living space where your spouse watches Netflix. Planning for the little details, the small moments from which you derive joy, is a great way of approaching your new condo’s design. Before we delve into the details, let’s talk about healthy living. One of the most important things to me — and probably to any other parent — is providing a safe, healthy living space for my family. If you’re single, this applies to you, too, as we need to look out for our own health as well. Before you develop your design plan, analyze the condo building from a safety perspective. Consider energy efficiency, toxicity of building materials, fire safety and geography. Ensure the parking garage is well lit and will provide easy, but safe, late-night access. Once you’ve done your due diligence with respect to safety, you can move ahead to the fun part — designing your condo lifestyle. Some of the most appealing female-friendly design elements I’ve seen are found in bathrooms. A ledge or seat in the shower can be excellent for exfoliating or shaving. Most condos do not have windows in the bathroom, but lighting can be optimized so that you can put on your makeup and not look like you’re ready for the stage. Other bathroom details I personally like include in-shower alcoves for storing shampoo bottles and soap, a heavy-duty fan to prevent mildew and heated floors and towel rails for winter months. The kitchen is another great space that can be tailored to your personal lifestyle. If you cook a lot of pasta, why not install a pot filler tap adjacent to your stove so that you don’t have to carry heavy pots between the stove and sink? And I’ve found that women want large islands with counter seating so that being in the kitchen is a joy rather than a chore. Dream closets come in all sizes. The best closets are walk-in with centre islands, assuming you have the space for one. Why not work with a designer from a company that specializes in this area, like California Closets? They can enhance any condo for the better. Often, what women want men want, too. These are just some details to help you plan your new condo lifestyle.